These are the walls you look at every day. We can deliver that fresh, clean look your home deserves! The outside of your house needs tender loving care as well! Just think, it keeps the British weather at bay. Isn't it time it got a nice new look? We understand the special needs of business. Commercial contracts are always undertaken with the requirement to cause minimal disruption to trade as one of our main considerations. From re-hanging a door to bespoke shelving or floors, we can help! 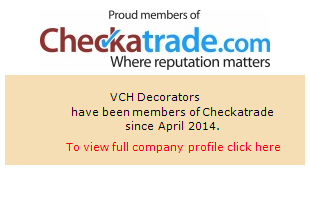 VCH Decorators is a friendly firm of decorators working in Berkshire and surrounding areas. We understand your home is your pride and joy, and we can help you keep it looking at its best. Our reputation is important to us, and references are always available on request. We are also proud to be members of Checkatrade.com, which is your assurance of our professionalism and competence. We have been Decorating since 1990 and have a very experienced team of decorators. Our business has been built up solely through word of mouth and have many satisfied customers. Our aim is to give you our expert advice and workmanship, providing you with a professional and tidy job. We can perform the smallest of decorating jobs, from repairing a leaky ceiling to large projects, such as offices and schools. All at very competitive prices. We cover all aspects of decorating Interior and Exterior. Including coving, wallpapering, plastering and carpentry work.